Frosé all day! 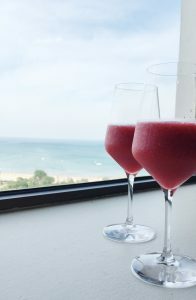 Summer is here and there is no better way to beat the heat but a tall glass of Berry Refreshing Frosé. What exactly is frosé you ask? It’s basically a wine slushy! Made with summer’s favorite pink beverage, ice cubs and fresh berries. Although I normally don’t know what the phrase “leftover rosé” refers to, this recipe will make that clear. Make this recipe ahead of time and serve with Sunday Brunch in place of Mimosas. Remember to plan ahead and freeze your wine-cubes ahead of time, at least 6 hours in advance. Fill ice cube trays with leftover rosé (you know, the part of wine you didn’t finish last night) and freeze for at least 6 hours. Because of alcohol content, the cubes won’t freeze all the way. 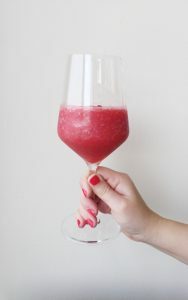 Fill the blender with berries (I used about a cup of strawberries and a cup of raspberries), throw in the rosé ice cubes and blend until your preferred consistency. 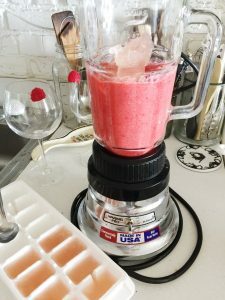 Originally, I poured a half glass of rosé in the blender with the berries and blended it first, but I think the consistency will be a little better if you skip this part and freeze the whole thing into ice cubes first. You may need to add some regular ice cubes in to make this berry frosé a little thicker. Serve in chilled glasses garnished with a fresh raspberry.